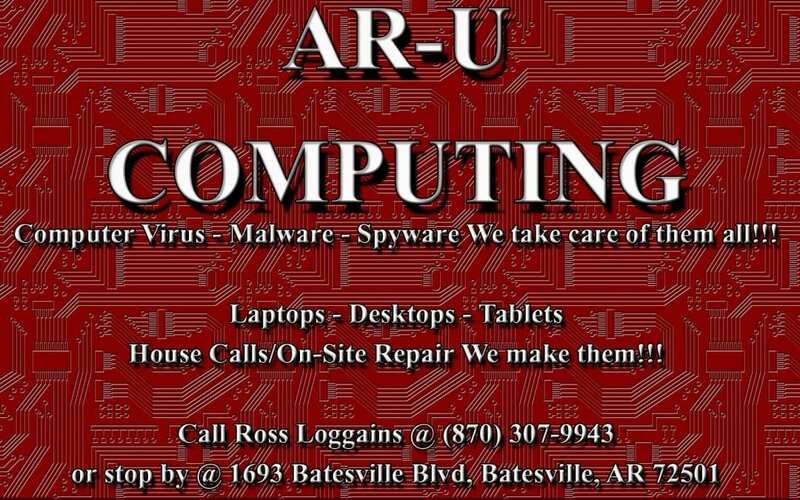 AR-U Computing Computer Sales/Service in Batesville – Available to Assist Everyone in this High Tech World in which we so live!! The world is definitely a high-tech place now in every way for youth and adults, all businesses, and games, our phones, etc. Our schools all teach our kids at a very young age to be computer efficient! So, we all may have heard the term, GIGO. That means Garbage In, Garbage Out. I learned that years ago in my first computer class at Gateway, now UACCB. It means a computer has to be told what to do, sort of. Well, if you have done all you know to do, and you can’t get your business page online, or Facebook browsing, or online school classes, or check your email, you have a great business right here in Batesville to help you! A relative pointed me to him when my laptop had issues with the thingy that plugs in the back of the what-cha-ma-call-it. Anywho. I can say I am very satisfied with the job Ross and Josh did on fixing my laptop, and the price was so affordable! But, you can’t just walk in and leave. Look at what he sells! I ended up buying a Microsoft refurbished tablet that actually purrs when I touch the screen! They ordered me a keyboard and heavy duty cover with Armour Shield for the front of it, and I have a new favorite! Give them a shot! Josh and Ross can fix anything, and they actually explain what happened and how they fixed it; such hints are really a bonus! I now have some new friends, I have their phone number, and when anything weird pops up, one of them always answers the phone. They are honest and highly proficient and knowledgeable in all computer technology and personable young men, who will do what it takes to get you back to your tech, whether for pleasure or work! Tell them Ginger sent ya!! 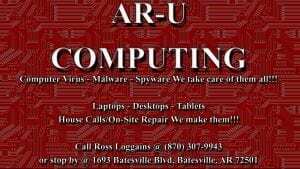 Per Owner Ross Loggains: Here at AR-U Computing we help our customers figure out their computer issues and provide cost effective solutions. We provide many computer services, everything from malware/virus removal to operating system installs, data backup, laptop repair, various tablet repair, and many more computer services. With AR-U Computing we like to educate our customers on how the computer landscape is and how it has changed over the last several years and how it affects them when it comes to operating a computer in this “New Age” of computing. 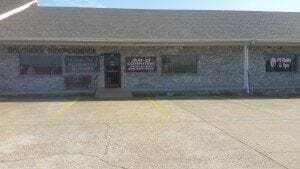 We have been in business since January 2013 at 1693 Batesville Blvd., Batesville, AR. We’ll fix them all!!! And if they ain’t worth fixing, we will let you know!